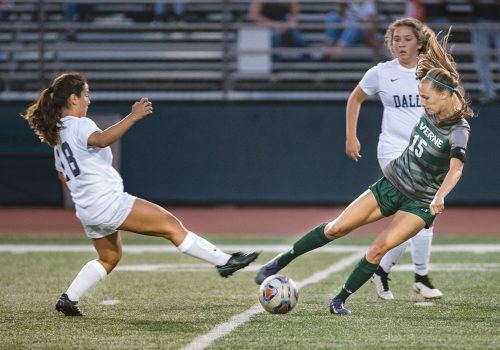 La Verne women’s soccer could not break a tied with the Dallas Crusaders, as the game ended in a tie, 1-1. Even with two overtime periods, neither team could break through and take the lead. In the first half, both teams were held scoreless. The Leopards were able to holding the Crusaders to only one shot in the entire first half. La Verne was able to get five shots off in the first half, but none of them found the net as sophomore goalkeeper Natalie Kutac was able to save two of the five shots on goal. The Crusaders struck first as freshman midfielder Bekah Gonzalez was able to score during a set play at the 46 minute mark in the second half. Gonzalez scored on an unassisted corner kick. “We have nine seniors so we are a very old group,” Pehanich said. Down 1-0, La Verne senior forward Andrea Story took the ball and scored an unassisted goal at the 66-minute mark to knot the game at 1-1. Leopard’s back line was able to push the ball up to senior forward and team captain Cambria Smith. The ball was kicked out of Smith’s control by a defender. Luckily, Story was right there to get the ball and score. “We went a goal down early in the second half so I just knew we needed to get one back,” Story said. La Verne was able to control the ball well throughout the entire game; especially the first half limiting Dallas’ touches and keeping the ball on their side of the field. “For the first game we really kept the pressure up,” senior captain and outside midfielder Juna Bouchekara said. The Leopards had a total of 17 shots on goal but could not convert, except for the one goal during the second half. Six of the Leopards’ 17 shots came in the overtime periods, La Verne took 13 more shots than Dallas. So they were creating looks for one another but could not finish those opportunities. With La Verne taking more shots, they controlled the ball and pace for almost the entire game but could not score another goal, with many of their shots going high and wide. One of the improvements Bouchekara wants for the future of this team is to learn how to finish the attempted shots on goal. “If you can’t score, you can’t win” Bouchekara said. The leopards have been focusing on their defensive shape throughout the offseason. The team is very optimistic about the future of their season with head coach Pehanich, now entering her sixth season with the leopards. “I think we have quicker defenders in our conference and that is going to be a greater challenge for us, Smith said. La Verne’s record moved to 0-2-1 with losses to North Central, 1-0, and a double-overtime loss in their Southern California Intercollegiate Athletic Conference opener to Claremont-Mudd-Scripps, 2-1. The Leopards will continue SCIAC action against the Sagehens of Pomona-Pitzer at 11 a.m. as they look to get into the win column for the first time this season.